NOW AVAILABLE from Amazon and other booksellers. "Simon Prince’s wonderful book presents a principled model-based approach to computer vision that unifies disparate algorithms, approaches, and topics under the guiding principles of probabilistic models, learning, and efficient inference algorithms. A deep understanding of this approach is essential to anyone seriously wishing to master the fundamentals of computer vision and to produce state-of-the art results on real-world problems. I highly recommend this book to both beginning and seasoned students and practitioners as an indispensable guide to the mathematics and models that underlie modern approaches to computer vision." "Computer vision and machine learning have gotten married and this book is their child. It gives the machine learning fundamentals you need to participate in current computer vision research. It's really a beautiful book, showing everything clearly and intuitively. I had lots of 'aha!' moments as I read through the book. 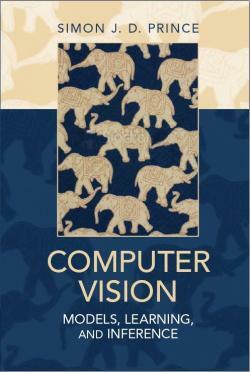 This is an important book for computer vision researchers and students, and I look forward to teaching from it." "With clarity and depth, this book introduces the mathematical foundations of probabilistic models for computer vision, all with well-motivated, concrete examples and applications. Most modern computer vision texts focus on visual tasks; Prince's beautiful new book is natural complement, focusing squarely on fundamental techniques, emphasizing models and associated methods for learning and inference. I think every serious student and researcher will find this book valuable. I've been using draft chapters of this remarkable book in my vision and learning courses for more than two years. It will remain a staple of mine for years to come." Full PDF of book (116Mb). Right click and select save. You may take one copy of the book draft for personal use but not for distribution. Please do not post the draft on other sites but link to here. (last update: 07/07/2012). Suggested syllabi for courses "Machine Learning in Machine Vision" and "Machine Vision"
Please mail errata to s.prince(at)cs.ucl.ac.uk. I will incorporate them into the next printing of the book and add your name to the list of acknowledgements. Below are listed a number of additional resources that complement the data in each chapter. These include links to project pages, other descriptions of the same material and useful datasets. Feel free to mail me to suggest other useful material. Textbook: Computer vision: algorithms and applications by Richard Szeliski. Textbook: Bayesian reasoning and machine learning by David Barber. Textbook: Multiple view geometry in computer vision by Richard Hartley and Andrew Zisserman. Textbook: Information theory, inference and learning algorithms by David MacKay. Textbook: Feature extraction and image processing by Mark S. Nixon and Alberto S. Aguado. Textbook: Pattern recognition and machine learning by Christopher M. Bishop. Webpage: List of other vision textbooks. Document: Tutorial on probability theory. Document: Compendium of probability distributions. Document: Conjugate Bayesian analysis of the Gaussian distribution by Kevin P. Murphy. Document: Introduction to Bayesian learning by Aaron Hertzmann. Document: Bayesian inference: an introduction to principles and practice in machine learning, by Mike E. Tipping. Document: Statistical estimation by Max Welling. Document: Gaussian identities by Sam Roweis. Document: Introduction to machine learning by Kevin Murphy. Document: Generative or discriminative? Getting the best of both worlds by Christopher M. Bishop and Julia Lasserre. Document: Linear models by Max Welling - Information about factor analysis, PPCA, and PCA. Document: Mixture of factor analyzers by Max Welling. Book: Gaussian processes for machine learning by Carl Edward Rasmussen and Christopher K.I. Williams. Code: OpenCV. Contains good implementations of face and pedestrian detection using boosting. Document: Decision Forests for Classification, Regression, Density Estimation, Manifold Learning and Semi-Supervised Learning by Antonio Criminisi, Jamie Shotton and Ender Konukoglu. Textbook: Bayesian reasoning and machine learning by David Barber. Full text available online. Webpage: Graphical models and Bayesian Networks by Kevin Murphy. Website: Middlebury stereo website. Includes, code, datasets and evalution details for stereo vision. Code: Matlab pipeline for finding facial features. Code: C code for max flow from Vladimir Kolmogorov. Code: C++ code with Matlab wrapper for alpha expansion algorithm. Project page: Image quilting for texture synthesis and transfer. Includes video. Project page: Shift-map image editing. Includes video. Project page: Grab cut. Includes video. Project page: Image based visual hulls. Includes videos. Code: ARToolkit. Augmented reality tracking software. Tutorial: RANSAC for dummies. Includes code. Project page: Photo-Tourism. Includes videos. Code: Bundler. Bundle adjustment software. Code: Patch-based multi-view stereo software. Data: Middlebury multi-view stereo datasets. Code: Active appearance models API. Includes datasets and tutorial material. Data: Shape data including faces and hands datasets. Textbook: Active Contours by Andrew Blake and Michael Isard. Project page: 3D morphable models. Includes videos. Project page: SCAPE. Includes videos. Data: Labelled faces in the wild. Database of 13000 faces suitable for face recognition research. Project page: TensorTextures and Tensor Faces. Includes videos. Project page: Multi-factor GPLVMs. Includes videos and code. Videos: Example videos of contour tracking. Book: Iterative methods for optimization by C.T. Kelley. Document: Matrix identities by Sam Roweis.